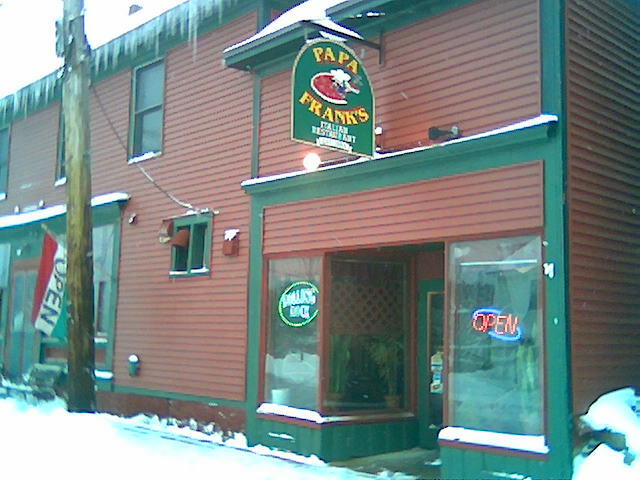 Papa Frank’s is well known for their inexpensive Italian food in Winooski Vermont. It’s even less expensive if you use the %10 off coupon from their website. 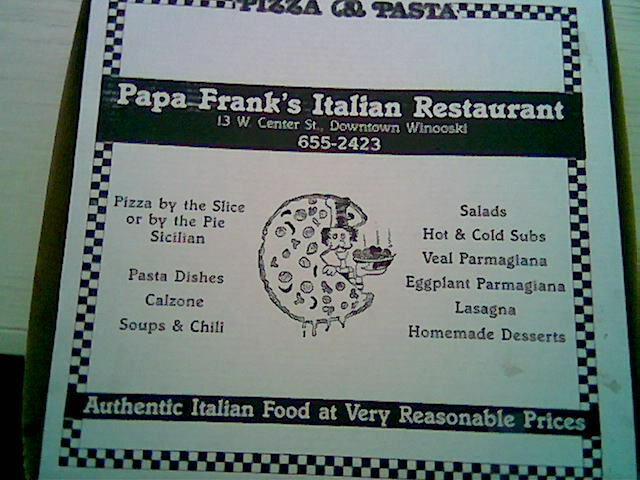 I had a longing for anchovie pizza and I like Papa Frank’s pasta, so I called in an order. Papa Frank’s Pizza Box – I love the fact they have their own custom boxes. Marco’s Pizza is next to the Blockbuster on Williston Road in South Burlington Vermont. 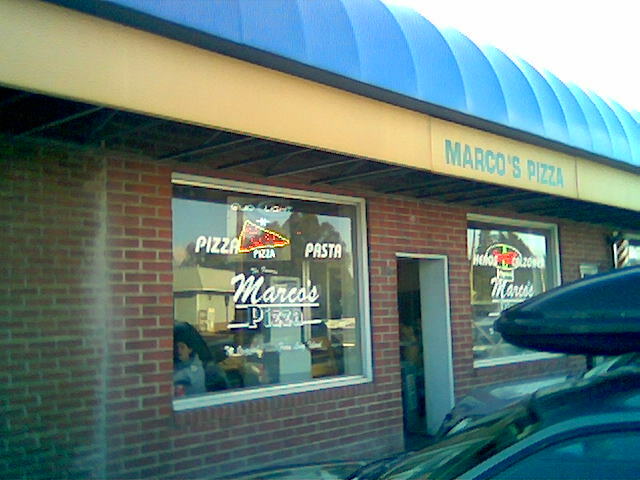 Marco’s is a great “Pizza and a Movie” place, I like to order my food and then go into Blockbuster to pick out the DVD, finally pick up the food at Marco’s. As far as lunch goes, they have a great pizza special that is hard to beat. So two slices, one 16oz fountain drink… $4.25 with tax. This a very inexpensive satisfying lunch, a good way to balance more extravagant lunch excursions. The sauce is awesome, a nice balance of sweet and acid, there is also a rich tomato flavor. The mozzarella had good flavor and consistency. 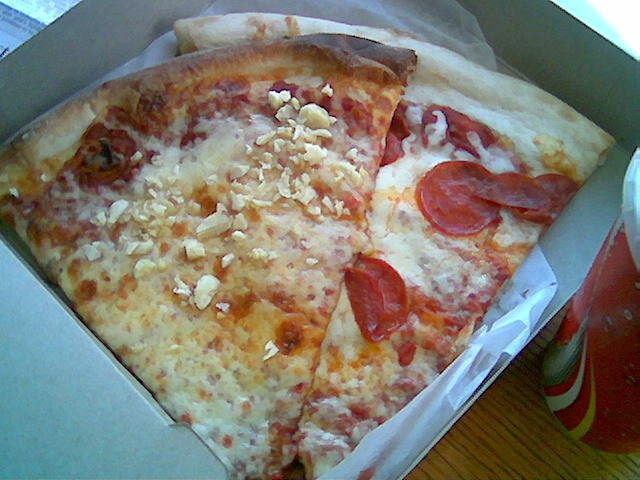 The crust however was slightly lacking, the garlic slice was mostly crispy and chewy, but the pepperoni slice was under-cooked. 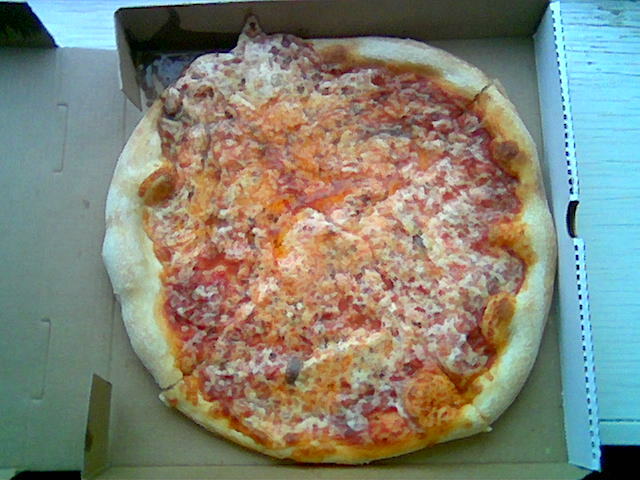 The pizza was still definitely edible as the crust is very thin, so it’s not gummy. If you love garlic, the garlic slice is for you. Multiple cloves of fresh garlic are served chopped on the slice. Enough garlic to keep away any vampires, and probably coworkers. The pepperoni is your average greasy goodness. Other than the phenomenally cheap pizza special, Marco’s pasta is good (again great sauce), and they make their own ciabatta bread. 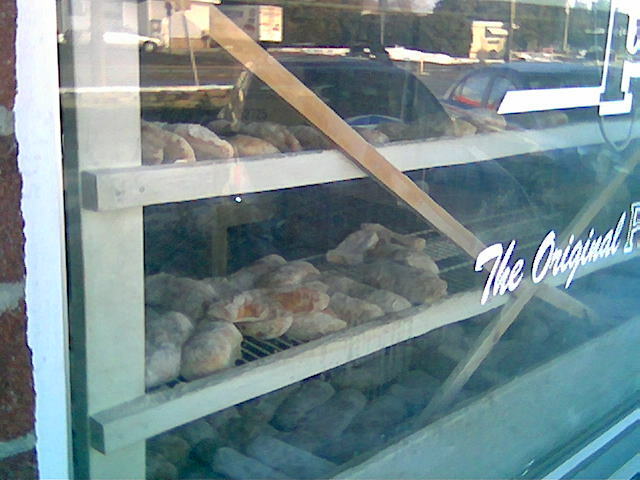 The ciabatta bread rack is a cool thing to see as you walk in, it adds to the ambiance of Marco’s. Fresh ciabatta bread and good sauce, mean that subs are excellent here. Marco’s a nice, inexpenisive place for lunch. 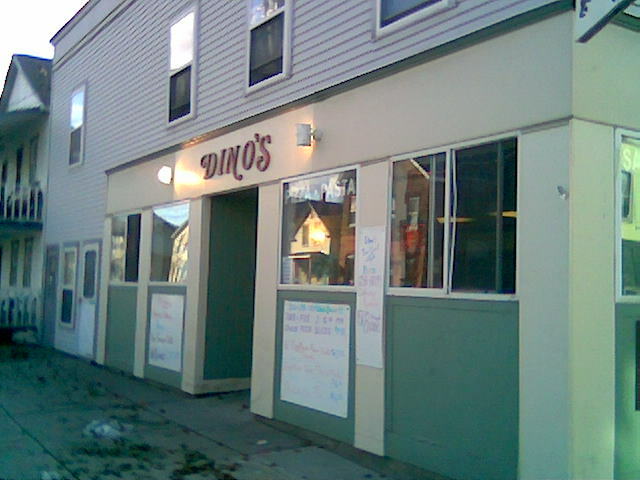 Dino’s has two locations in Burlington Vermont, one in the Burlington Town Center AKA Square Mall AKA Burlington Mall and the other in a new spot (formerly Monaco’s) in the ONE (Old North End). Normally I wouldn’t go to Dino’s unless I had business in the mall, so I was glad to see they had a more convenient second location. 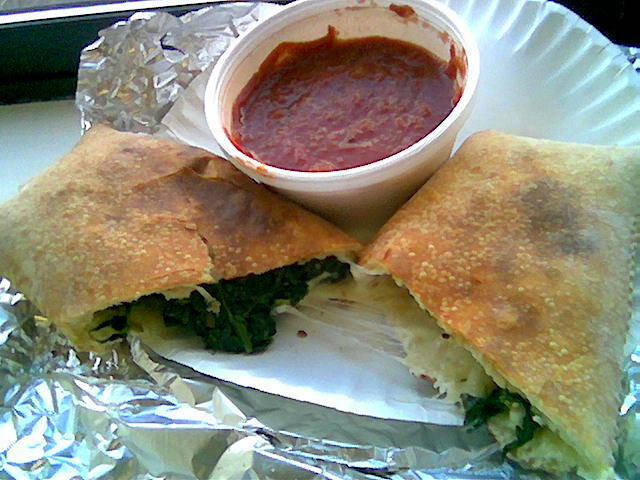 Their pesto pizza and sandwiches are pretty good, but my favorite thing to order is there spinach and cheese roll. Dino’s friendly cook informed my that this was going to be the best “Pizza Roll” ever. I was psyched to find out that he made the roll fresh (unbaked dough), likely due to volume concerns the mall location has the Pizza rolls standing by ready to be re-heated. So I would recommend calling in your order to this location, as it took a few minutes for the roll to bake. The cook was right, the aroma of freshly baked rolls filled up my car as I was driving back to work to eat my lunch. The in-house made tomato sauce to dip the roll in had a nice balance of sweet and acid . One caveat, I couldn’t figure out why one half of the roll had %90 of the spinach of cheese, I realized that the pizza roll was stored vertically and the molten contents had obeyed gravity. So if you’re traveling with your coveted pizza roll, make sure it’s lodged horizontally. I like eating these rolls, because it tastes good, is fun to eat, and is definitely healthy. These rolls are steal at $5.50 with tax. You can’t have a food blog about lunch and not mention pizza. 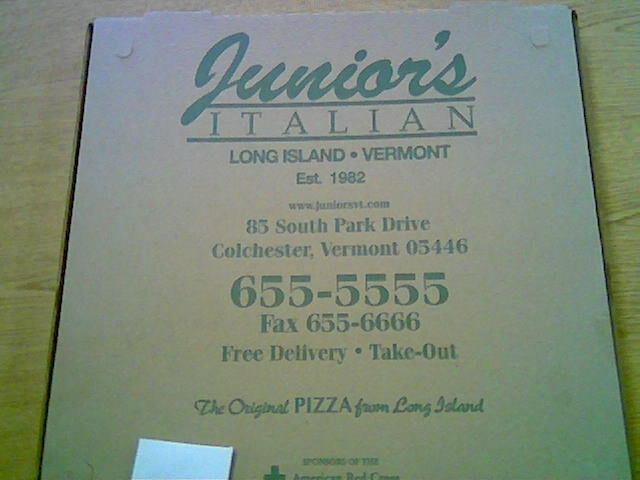 You also can’t mention Pizza in the Burlington area, without mentioning Junior’s. Judging by their new space behind the Burger King, off of I-89 exit 16 in Colchester, Vermont they’ve been doing well for themselves, there is a reason for that. Despite the fact that they are now in a building I affectionately refer to as the “Pizza Factory” (it’s much larger than their old spot) they still turn out amazing pizza. This is the best pizza to be had around town. Pictured above is their pizza box, once of the signs that you’ve “arrived” as a pizzeria is having your own box (yes they deliver). The Pesto is fresh, the basil smells great with the garlic. The mozzarella tastes great and has great texture. Sesame Crust, you must try it if you like sesame seeds. The oven toasts the seeds, elevating the crust and thus the pizza. Speaking of crust, even without the sesame crust upgrade, Junior’s consistently has great crust: it’s both chewy and crispy. One small complaint, the pesto this time was run through a food processor (like you would normally expect), but this was not the norm. 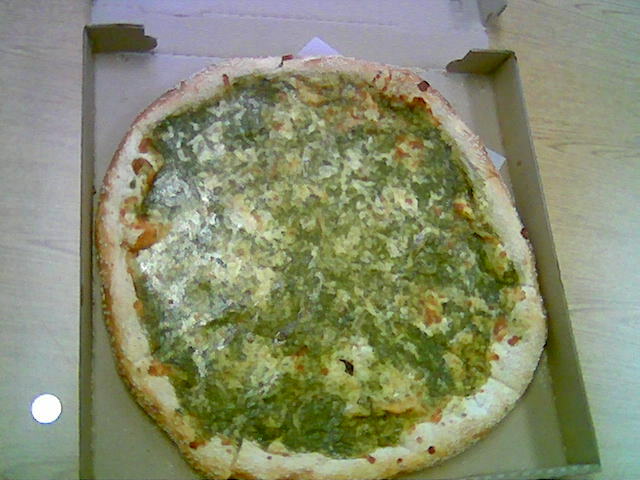 Previously the pesto consisted of chopped basil, chopped garlic, and whole pine-nuts (also of course the other requisite ingredients). A quick call to Junior’s told me that this was an attempt to make this pie easier to assemble for the cooks, but they would gladly do it the old way if I requested it (I recommend you do). 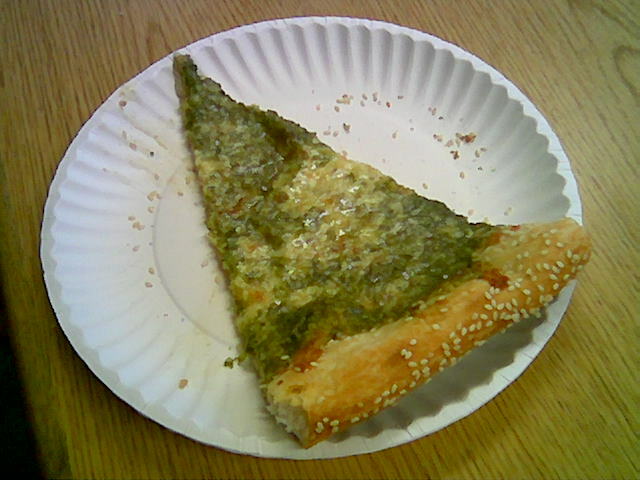 Even with that being said this is the best pesto pizza around. I believe this pie was around $17-18, a little pricey but in a league of its own. This is why you’re fat.